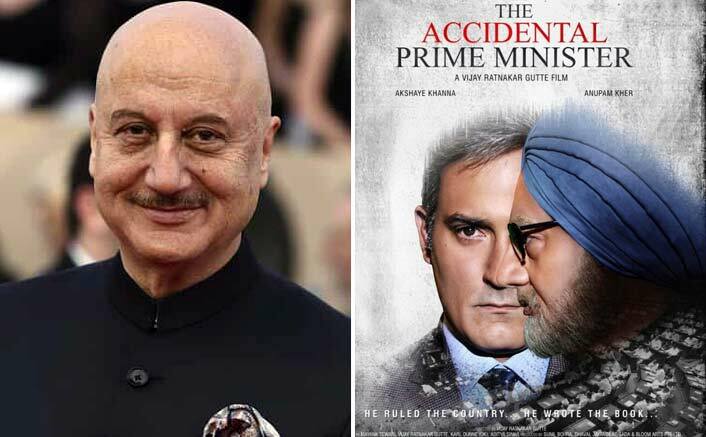 Actor Anupam Kher, who is gearing up for the release of his forthcoming film The Accidental Prime Minister, has said that initially he didn’t want to be a part of his forthcoming film as he thought that it will be politically controversial film. Anupam Kher was interacting with the media at the trailer launch of The Accidental Prime Minister along with his co-actor Akshaye Khanna, producer Jayantilal Gada, Sunil Bohra and director Vijay Ratnakar Gutte on Thursday in Mumbai. “About one-and-a-half years back, my friend Ashok Pandit told me that there is a film being made on Dr Manmohan Singh, and of course everybody heard about the book and the controversy behind the book. So, my first reaction was that I shouldn’t be part of this film because of so many reasons. Kher added that the role of Dr. Manmohan Singh challenged him as an actor. “One day, I saw Dr. Manmohan Singh walking from one place to another on the television. So, the actor inside me told me if I could walk like him. But I was a disaster. That challenged me. I rehearsed his walk for 45 minutes but I couldn’t get it right so, I called the makers for the narration of the script and I was very fascinated by it. Talking about preparations he did to play role of Dr Manmohan Singh, Kher said, “I took about 6-7 months to prepare this role. I must have seen at least 100 hours of footage but the most difficult was the voice part of it because he has a typical voice. Then I told myself that if your work is not challenging then, what’s the benefit to do it? When asked whether he is worried that this film can be opposed by Congress as makers have shown a controversial relationship between Dr. Singh and his Congress party, he said, “I feel you have to be little more careful because people take only two minutes to criticize you. I feel this has to be perceived as a film and it shouldn’t get into controversy because of its political background because you need to have guts to make this film and I must say our director and producers have the guts. The film is based on the 2014 memoir of the same name by Sanjaya Baru. The Accidental Prime Minister will hit cinemas on January 11. The post The Accidental Prime Minister: Here’s Why Anupam Kher Didn’t Wanted To Be The Part Of This Film appeared first on Koimoi. Previous ArticleSimmba Box Office Day 1 Advance Booking Report: All Set For A BLOCKBUSTER Start! Next Article Smriti Irani Just Had A ‘Aunty Mat Kaho Na’ Moment With Janhvi Kapoor!